There is always and continued debate between pond contractors about whether rocks and gravel in a pond is a good idea or not. I personally think a lot depends upon whether you are planning on building a pond or a pool. If you are building a pond then you are going to have plants in the pond, and so the level of maintenance is going to be relatively high. Adding rocks and gravel is going to make less of a difference to this. 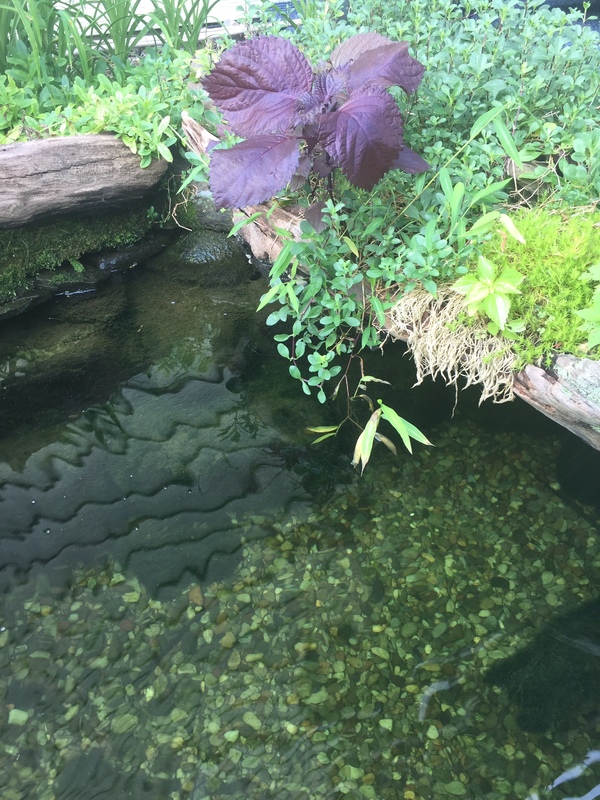 With a pool you are less likely to have plants and other objects in the water, the pool can be almost sterile with just fish in it and powerful filters removing the waste. In a pool such as this adding gravel and rocks will create waste traps that will reduce the efficiency of the filtration system. The debate is always about maintenance. The rocks and gravel do not create any more waste, but they do make it harder to clean and maintain the pond, especially when there is a heavy load of waste. Gravel though does create a much larger surface area for the beneficial bacteria to live on which break down organic waste. Gravel pond design and rock pond design also give the pond a much more natural appearance, covering up the liner, plumbing and pumps, which personally I much prefer. With rocks and gravel it is possible to create a much more natural-looking pond design. Over time rocks and gravel will collect a fine biofilm and will become coated with bacteria and algae. A 10mm film of algae is the perfect situation, as this layer will act as a natural filter, removing much of the organic waste and breaking it down to harmless nitrogen. If the algal film grows longer than this then it is likely that the pond is not in balance and there is a build-up of nutrients in the pond, which may need a helping hand to remove. 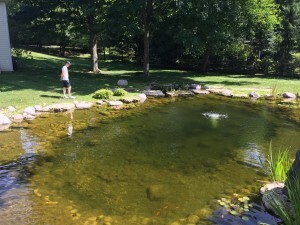 For rock pond design and gravel pond design, a small amount of gravel – two to three inches deep – is just enough to cover the bottom of the pond and is often the best compromise. Larger fish, especially koi, will help to turn over the gravel, dislodging waste and allowing water to percolate through the stones. I have a lot of customers who have koi pools with a layer of gravel on the bottom and these are kept clean by the action of their fish. This reflects what happens in natural lakes, where the fish will be foraging in the substrate, particularly gravel areas, as these tend to harbor more invertebrate food. Most often gravel ponds do not work because the filtration system has not been designed correctly to remove all of the waste load put on the pond. This consists not only of the waste from the fish, but also decaying plant material in the pond, which can blow in, fall from neighboring trees and plants, or from aquatic plants. If all of this waste is allowed to build up then the gravel will sooner or later become choked with anoxic organic silt that will kill the healthy bacteria and severely effect the water quality. So in my opinion, if you use the right sized gravel or pebbles, say 20 to 28mm gravel, that stays quite open and is easy to clean in the gravel pond design then there is no reason why you should not have a layer of stones in the pond. Some debris will collect within the gravel, but this is completely natural and larger fish will stir this up. You can also stir the gravel bed up from time to time as this will dislodge much of the waste trapped their and this can be collected by the filtration system. If you want to have a koi pool with gravel then it is possible to have internal filtration constucted from a grid of two to three inch pipework. This can be powered by air that will pull the water through the system as the air rises, or with a more traditional pump feed. I actually think that the fish prefer to be in a gravel pond design with a gravel substrate as it gives them more to do and keeps them grubbing around, much as they would do in the wild. Yes, there is an added financial and work cost of having gravel in your pond, but as long as you get the loads right then there is no reason not to have gravel in the pond. 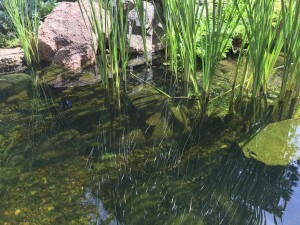 If your main concern is to have a high loading of fish in the pond then avoid gravel as you are adding an extra complication to the pond when it comes to keeping it clean. A high fish load will invariably mean that you have to carry out more regular cleaning than otherwise would be the case and the stones will make this more difficult to carry out. So the debate continues. I know pond designers who fall into both camps. Generally speaking this depends upon what the main aims of the pond design are. It would be difficult to design a natural-looking pond that did not contain rocks and gravel to help disguise the liner. Alternatively, if your sole aim is to keep prize koi in the most pristine water conditions possible then removing any potential waste traps has to be the primary concern.